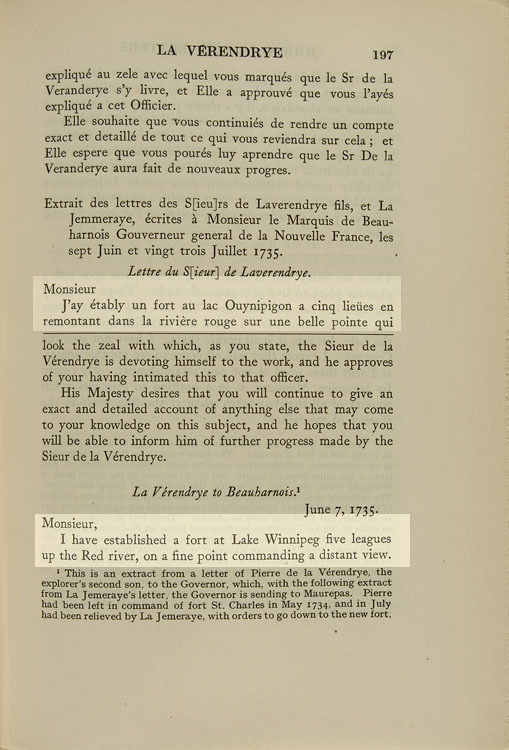 In this letter to the Marquis de Beauharnois, the governor of New France, la Verendrye's son explains how he established Fort Maurepas on the Red River. The letter is dated 7 June, 1735. p197-98, 2nd pgh: "Monsieur, I have... my father." I have established a fort at Lake Winnipeg five leagues up the Red River, on a fine point commanding a distant view. There are many fish in this river; it is a fine spot and a pleasant place to live at; game abounds. There are thirty portages but not one bad one. The fort and the river bear the name of Maurepas. I could not establish myself nearer the Lake, because it is all prairie there. Fort Maurepas was named after King Louis XV's colonial minister, the Comte de Maurepas, who was becoming impatient with the slow pace of exploration.